If you live in Northern California, you will have experienced the effects of forest fire smoke in the late summer and fall. Some years the fires are worse than others - and curiously, it's said that if there is more rain in the springtime, it can lead to greater fire risk - as the early summer grass will have grown longer before drying out to tinder-dry in California's long dry summer. Lightning strikes often start blazes, but faulty electricity supplies, carelessly-tossed cigarettes and even broken glass can start fires. Even for those not directly caught up in the blaze, the haze and stinging smoke of wildfires drift widely across the state and beyond - causing sore throats, and possibly worse symptoms. In areas of Northern California such as Humboldt and Trinity Counties, forest fires often continue from late summer until the end of "fire season" (i.e. when it rains, usually around October). How dangerous is wildfire smoke? It would appear to be a real health hazard:A past Western Journal of Medicine report from 1999 forest fires stated that "During the weeks of the forest fire, medical visits for respiratory illnesses increased by ... 52% over the previous year." The same report goes on to state that HEPA filters had a positive effect and reduced symptoms associated with exposure to wildfire smoke: "Among those who ran HEPA cleaners in their home, increased duration of use was significantly associated with decreased odds of reporting worsening respiratory symptoms". It was also stated that masks (presumably the paper variety although this is not stated) did little to reduce symptoms. In short - all kinds of things! 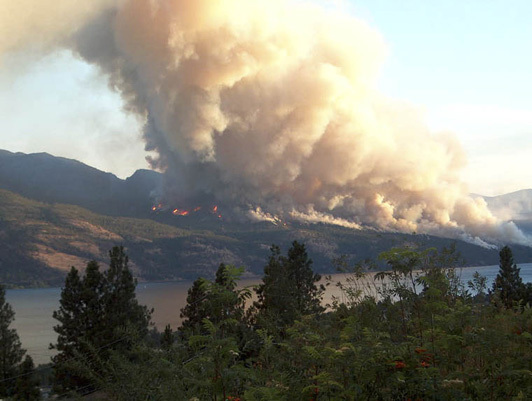 According to http://www.forestencyclopedia.net/p/p818 - some of the constituents of wildfire smoke might be:Benzene; Nitric Oxide; Ozone; Sulphur; Polynuclear Aromatic Hydrocarbons (PAHs) such as Benzo[a]pyrene, benz[a]anthracene; Methyl Chloride and Methyl Bromide; Aldehydes such as Formaldehyde, Acrolein and Formic Acid; and more besides. Many of these substances can cause health problems in sufficient quantities.